Should you start your own business when you have no money? A reasonable person might say no. Military spouses are slightly unreasonable though, I mean seriously- is it 100% reasonable to fall in love with someone that you are forced to say goodbye to over and over and raise your kids on your own and move all over the country having to say goodbye to friends along the way? Maybe that’s why military spouses have exactly what it takes to start their own business. Resilience. Strength. Ability to dream and conquer. In fact, the biggest reason we were able to stop falling behind on bills and start getting ahead was the extra income I earned from home while I built my business (which by the way, cost me next to nothing to start) and it allowed me to stay home with my kids. So basically, if you already have a computer and internet hookup, you are looking at less than $20 to start up your own business. In the beginning, you will have very little costs, which means anything that you make is just profit. And everytime you move, you don’t have to go down to one income while you job hunt and suffer through unemployment. As you grow, you will need to invest in marketing tools, education/e-courses, and advertising. By then, you will be making enough to cover these costs. Now, eventually you may want to start producing physical products (I highly recommend starting with digital products or teaching as it’s much more profitable, especially at first). You might also want to trademark your business name and turn your business into an LLC. Once you start your own business, you’ll eventually want to invest in a quality course that teaches you how to run a successful business, sign up for a paid email marketing service so that you are able to form a bond with your readers/clients (it’s easier to get repeat business than to always be looking for new clients anyway, right? ), buy a laptop, etc. All these business expenses add up. Most of these expenses will pay for themselves (like marketing tools and online courses) but trademarking and the legal side of business ownership might require a heavier investment. Not to mention military spouses businesses that have tradition physical products, may need an even bigger investment– at least at first. I’m all for NOT having debt. Most of these options don’t involve taking out a loan or owing money. However, some businesses may require a loan, so I will include loans available to military spouses (and also service members and veterans). Crowdfunding is when you get investors (or “backers”) that donate money to your business– think: gofundme but for business– and generally you will offer your backers a gift as a thank you for investing. The downside is that you won’t get any money unless your goal is reached. An example of a crowdfunding site is Krowdster. This scholarship (provided by the National Military Family Association) awards up to $1000 to military spouses to help them build their own business. This is extremely helpful if you are looking for the extra money to trademark your business, apply for an LLC (depending on what state your in, this can be quite pricey) or any other business expense. The process is very quick, maybe 10 minutes. For more information or to apply, click here. When you are starting off, especially blogging– you will need to build your audience before you can really be profitable. Building your audience and building your blog will help you know what products your readers would benefit from and it will also help with getting brands to partner with your for sponsored posts. This doesn’t mean you need a million page views to be successful, in fact page views don’t even really matter unless you are relying solely on ad income. What really matters is your email list. You can be very successful with even a small email list, especially when it comes to affiliate income but it takes time to build up a list of even a 1,000. So, especially in the early stages of blogging, you might want to have a little “side gig” on your blog. For me, it’s graphic design. Graphic design doesn’t have much to do with my blog other than possibly teaching other military spouses how they can rock the graphic design portion of their business. But it supplements my blogging income enough to help me afford things like a new laptop and a good blogging course. When my business is profitable enough on it’s own (or to the point where I could make more in an hour of blogging than I would for an hour of graphic design work) I will stop doing it and focus on projects with a higher return on investment (ROI). Some other side gigs I’ve seen bloggers do is virtual assistant work, coaching, ghostwriting, and freelance writing. Cutting your expenses in other areas leaves you the ability to put more towards your business. You can also use the envelope system to set aside the extra money you have left over at the end of the month to invest in business-related expenses (remember, you can write those off in your taxes!) If you have no idea where to even start when it comes to setting up a budget you can stick with, read this article. As soon as you start making money, you will need to set aside some of that to use for your business expenses (so it’s not coming out of your pocket). If you are really tight for money and are starting a business to get into a better financial spot, use about 70% of your profits for your personal finances and set 30% aside for business growth. There are actually financing options available to military service members as well as military spouses and veterans if you need it for your business. 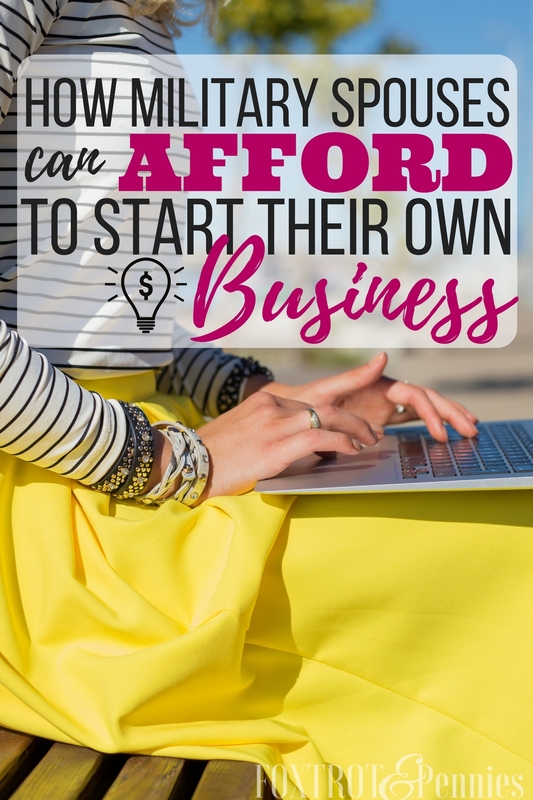 Not only can starting your own business provide you the extra money your family needs each month, but it’s more than possible to make a full-time income (or way more). Imagine creating a business that moves with you– never having to worry about money after PCSing (you have enough to worry about anyway) or having to go through the job hunting process again. Starting an online business takes almost no money down, and very little to maintain. Plus, there are options like crowdfunding, scholarships, side gigs, budgeting, and loans to choose from. I have never been in debt with my business. Even with the more expensive investments I’ve made, I’ve used one of the non-loan strategies in this article to be able to afford to grow my business. And you can too. Some of the links included may be affiliate links, I never promote anything that I don’t use and love and think will truly benefit you as a reader.